Posted by houseinvenice in Uncategorized. 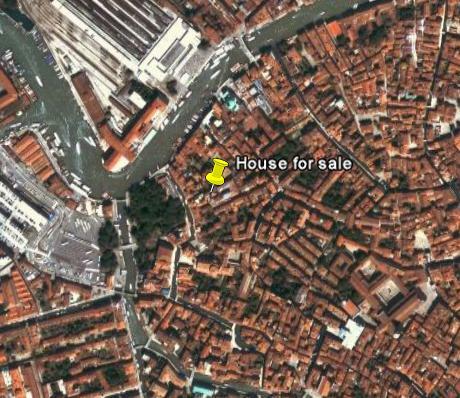 A classy, spacious apartment, ideal for a family of four or five, is for sale in downtown Venice. The apartment is located conveniently close (a 5-minute walk) to the train station and Piazzale Roma, but still is at just 10-minutes walk from Rialto, the center of the city. Below you can see two aerial views of Vence, with the location of the apartment. The building, which contains seven apartments all of similar size, was built in the late 1950s and is in perfect state. The roof, which includes a 2000 sq. ft. terrace at 60 ft above ground and a smaller 500 sq.ft. terrace one floor below, has been completely renovated recently. All common services are in perfect state of maintenance, and they include an elevator, a small private court, and the heating plant. The apartment for sale is located at the third floor. It has never changed property since the construction of the building. At the third floor the total surface is 1300 sq.ft., and the apartment includes an entrance, a spacious living room with large windows looking west, a kitchen, a studio, three bedrooms, and a bathroom. A second bathroom is very easy to create inside the master bedroom or in one of the other bedrooms.The apartment has windows looking west, north, east, and south, and is very luminous. There are two large and three small balconies at the main floor. The apartment includes a 400 sq.ft. studio at the ground floor, with heating and windows on the front, and a 170 sq.ft. attic at the fifth floor. The apartment is in good conditions and although it is advisable to personalize it with one’s taste, it can be inhabited with no modifications or repairs. The building has centralized heating, but the apartment includes a private air condition system. There is also an alarm with three sensors detecting motion. The monthly fees for heating, operation of the elevator, and cleaning of common facilities amount to 210 euros per month. The owner of a second-floor apartment handles the administration for free. The terraces on top of the building are common to all apartments, and although they are almost never used, they provide a spectacular 360-degrees view of Venice, including the recently built Ponte di Calatrava. The apartment, including studio, attic, and use of common areas, is for sale at the price of 800,000 euros. If you need to convert it to your favourite currency, please visit this site. More information, pictures, a map of the apartment will be added here soon, but they can also be requested by leaving your email in the comment section below. 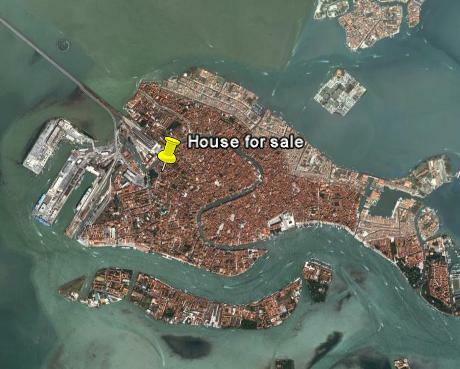 In this site you can find information about an apartment for sale in Venice. I will also sporadically add information about Venice, useful for visitors.